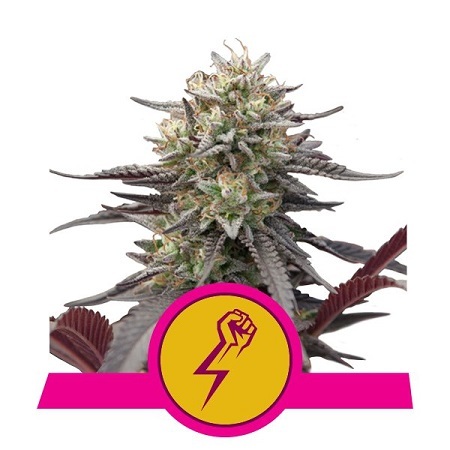 Give your mind, body, and soul a supercharged boost with this energetic hybrid..
Green Punch Feminized Cannabis Seeds by Royal Queen Seeds: Give your mind, body, and soul a supercharged boost with this energetic hybrid. Leaning slightly toward sativa dominance, green-fingered growers can expect enough mental buzz to keep them going all day long. Drowning under a mountain of paperwork? Stacked up with chores at home? Breeze through tasks the natural way, with a blast of Green Punch! Green Punch: Smash. It is true what they say, opposites attract. At least in the case of Purple Punch and Green Crack. The former is a heavyweight indica-dominant strain. She will wrap you up in her calming embrace and soothe muscular aches and pains. The latter, Green Crack, is a super energetic, upbeat strain with a love for going hard, heavy, and getting sh*t done. Together, this unlikely pair creates Green Punch, a down the line hybrid that focusses on mental respite before proceeding to weary limbs. As she begins to boost tired minds, users will feel motivated and energised. It takes several hours for the high to descend into your muscles, leaving you plenty of time to take full advantage of her euphoric effects. Aromas are just as energising. Enjoy wafts of invigorating citrus that develop into hints of grape and blueberry. She also has an incredible smoothness to her flavour, perfect for those who find smoking to aggravate their throats. Her flowers glow with vibrant pinks and oranges—a colourful suggestion of the cerebral power that awaits. Staying below 200cm, she won’t overwhelm novice growers, nor will she punish them for minor fluctuations in nutrients, water, or light. Expect around 20% THC, a highly respectable potency. Although she is not mind-blowing in the THC department, it is still recommended that first-time users take her slow and steady, at least to begin with. Feelings of euphoria will take hold from the first hit to the last, spurring you on. After 55–60 days, she will have finished flowering and be ready to harvest. Raised under ideal conditions, growers can expect 450–500g/m². Given how beneficial her energy-boosting effects are, it is best to cultivate her indoors. This way, yields can be maximised as you have greater control over contributing factors. She will, however, still do you proud outdoors. Expect to harvest near the end of September if you live in a favourable climate.